Drink up or work out? Is alcohol really better than exercise? An article came through my Facebook feed today which grabbed my attention. 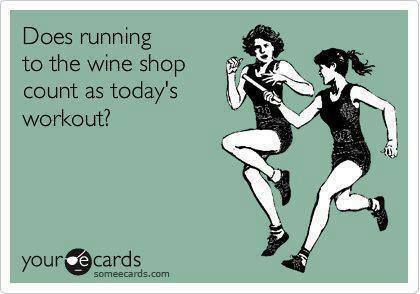 Entitled, “Is Drinking Wine Better Than Going To The Gym? According To Scientists, Yes!“, the article suggested that red wine with it’s particular blend of anti-oxidants was in fact proven by scientists to be more beneficial to you than slogging it out at the gym. Even though my aching legs wanted it to be true, my sceptical brain held sway. I needed to find the answer to this vital question. If it were true, it would be a good excuse to enjoy a glass of red on a more regular basis. I could even come up with my own little euphemism for it … yes … I would call it “my daily workout”! My thighs would be much happier. I took a deep breath and started to have a look through the published medical literature, looking to see if there were large studies or meta-analyses on red wine, exercise and all cause mortality. Interestingly there were a few studies on red wine, but mostly looking at its anti-oxidant effects, and not on the overall health benefit. However, there were a number of papers on the effects of alcohol consumption more broadly and its effect on heart disease and deaths from any cause. The study by Ronksley, Brien, Turner, Mukamal, and Ghali (2011) showed about two standard drinks of alcohol daily conferred a 25% reduction in deaths from heart disease (relative risk 0.75 (95% Confidence Interval 0.68 to 0.81)). The study also showed a small but statistically strong reduction in all-cause mortality of 13% (relative risk 0.87 (0.83 to 0.92)). The risk reduction of coronary heart disease from alcohol was also confirmed in a more recent study by Roerecke and Rehm (2014), who showed that death from heart disease was reduced by 36% for those who consistently consumed less than three standard drinks a day (relative risk 0.64 (0.53 to 0.71)). So far so good … “my daily workout” was looking promising. What about exercise? Well, a meta-analysis by Samitz, Egger, and Zwahlen (2011) analysed 80 studies involving more than 1.3 million subjects in total, and found that the highest levels of exercise had an all cause mortality reduction of 35% (relative risk 0.65 (0.6 to 0.71)). Damn! 35% beats 13% … I couldn’t give up in the gym just yet. I could feel my legs silently groaning. In fairness, the article by Samitz and colleagues found that 150 minutes per week of moderate to vigorous exercise a week had a relative risk of mortality of 0.86 (0.8 to 0.92), so that’s comparable to the benefit conferred by 2 standard drinks a day in the study by Ronksley et al. Strictly speaking, the numbers aren’t directly analogous as each study is limited by the vagaries of the statistics they pooled. Red wine isn’t better than going to the gym as the Facebook article suggested, but they are probably comparable. So, what to do with this information? I’ve decided that I need to adopt two daily workouts. Two standard drinks of alcohol a day is more than likely going to reduce my mortality, as will 25-30 minutes or more a day of moderate intensity exercise. I’m not exactly sure what the combined effect of both workouts will be on my longevity, but I’m pretty sure it won’t make things worse. One note of caution: Roerecke and Rehm (2014) note that the relative risk from alcohol is a J-shaped curve. More than three standard drinks a day increases the risk from alcohol, especially for women, which is in keeping with the Australian national guidelines for alcohol consumption (http://www.alcohol.gov.au/internet/alcohol/publishing.nsf/Content/guide-adult). This entry was posted in Biological and tagged alcohol, alcohol consumption, cardiovascular, confidence interval, disease, exercise, gym, heart disease, meta-analysis, mortality, relative risk, wine, workout by cedwardpitt. Bookmark the permalink.